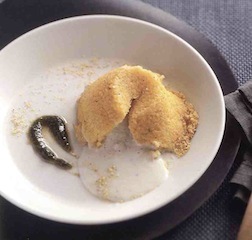 > Recipes>Squacquerone> Tortino di polenta con cuore colante di Squacquerone di Romagna D.o.p. Polenta pie with leaking heart of Squacquerone of Romagna D.o.p. 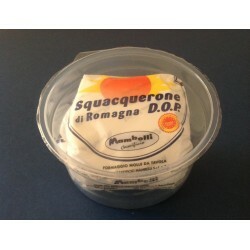 150 g of Squacquerone di Romagna D.o.p. Place the polenta in the bowl of a blender blender, add a little water and blend until you have a thick cream, if necessary, add more water. In a large bowl, crush the squacquerone of Romagna d.o.p in order to obtain a cream. Grease four moulds and sprinkle with maize flour. Fill in with the polenta cream the moulds till to half of their height. With the help of a spoon, make a hollow in the centre of the polenta, pour a tablespoon squacquerone cream and finish filling the moulds with the polenta cream.